View Photographs from the 2nd, 3rd, 4th and 5th Argust Day! Each August, the Argus Collector's Group sponsors an annual "Argus Day" in which we encourage everyone on the planet to carry an Argus camera with them and to take photographs for inclusion in an online gallery. Anyone can participate in the ACG annual Argus Day and you do not need to be a member of the group. We ask that people who do participate encourage their family and friends to join the fun as well. 1) Carry ANY Argus camera from the Model A right down to the digital cameras of today with you on Argus Day..
2) Throughout the day take photographs of anything that catches your eye with your Argus camera. 3) Submit one or two jpegs (color or black and white) via email to James M. Surprenant at argus@surprenantphoto.com. The maximum size for your images should be 600 pixels on the long side. Be sure to include a description of your subject, the camera and film used, and other notes of interest. This is never a contest, but is an online exhibit of the great photographs that can be made with Argus cameras. The goal is to have fun with our Argus cameras and to promote the brand to the general public. Please address any questions to Argus Day founder Marcy Merrill at marcy@merrillphoto.com or James M. Surprenant at james@surprenantphoto.com. 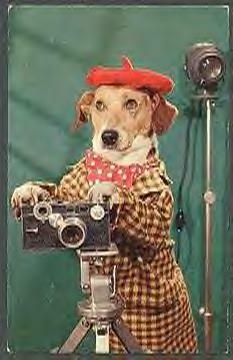 All the smart dogs will be out and about with their favorite Argus camera on Argust 4th!